The Mazda MX-5 Miata is the ultimate example of the saying “don’t knock it ‘til you try it.” Many car snobs look at a vehicle’s list of specifications, skimming past items like suspension design and curb weight, only in search of power output, interior amenities and its ability to make them feel manly. With the MX-5, Mazda treats automotive enthusiasts with a return to the fundamentals of performance – a lightweight platform on a well-balanced chassis that delivers a ton of fun on-track. For our 2016 ND MX-5 project, we chose to exploit its strengths for track use and eventually build a full-fledged racecar. 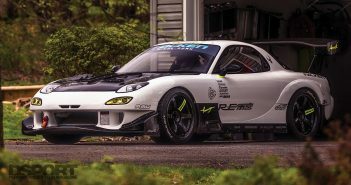 But first, the ND Miata will go through a series of streetable upgrades as we test and develop components to further enhance its performance on track. Although the first generation MX-5 started out as a 2,100 lbs. vehicle, the Miata family fell victim to the modern weight gain trend with its following generations, the NB and NC. The NC became the heaviest model of the three, pressing the scales at approximately 2,500 lbs. 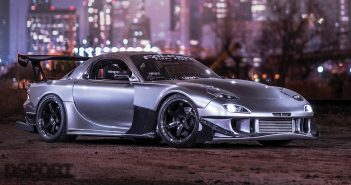 However, the 2016 ND iteration introduced a complete redesign of the MX-5 that happened to shed nearly 200 lbs to bring the total curb weight down to 2,330 lbs. Updates included a lower and wider body, near-perfect 50/50 weight distribution, lightened components, new suspension design, a lower center of gravity and a completely new powertrain. Given the many changes and improvements of the ND MX-5, it was only appropriate to test the car on a racetrack. Navigating the turns around Buttonwillow Raceway revealed where the ND MX-5 really belongs. The car’s low weight and low center of gravity complemented its performance around the corners. The car’s grip through and out of the corners was very predictable and forgiving, providing plenty of feedback to the driver through the wheel and suspension with enough time to make corrections whenever pushed beyond its limits. With 135whp and 134 lb-ft torque at the wheels, there were no surprises in the car’s acceleration. It had enough power to keep its pace up around the track, and the driver-friendly power band never penalized too greatly for excessive slides or overslowing corners. Ultimately, the car in completely stock form managed a lap time of 2’14.221” around Buttonwillow Raceway’s 13CW layout. Although the MX-5 handled better than nearly any modern car in factory trim, its handling characteristics showed that it was still capable of much more. This became especially evident in how much it flexed and rolled through corners. The car’s softness may have helped with setting the car to ride like rails once it settled on a lean, but it also felt mushy and slow to respond when initiating a turn. 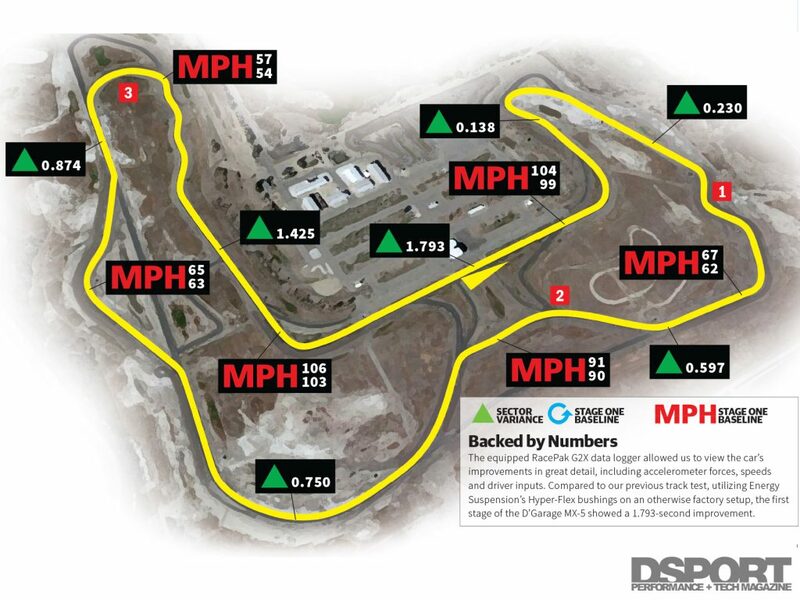 Track sections of changing directions like the esses and the right-left-right “Cotton Corners” on Buttonwillow exaggerated this effect, requiring the driver to wait for the car to shift its weight from one side to the other as it transitioned through the turns. It felt as if when turning the wheel, the chassis wanted to dart in the direction that the front wheels pointed to, while the body struggled to hold on and keep up with the rest of the car. This led to a time-costing procedure of turning the wheel, waiting for the weight transfer, straightening the wheel, waiting for the weight transfer again, and repeating the process. After the MX-5 made its baseline runs around Buttonwillow Raceway, the car took a trip to Energy Suspension’s headquarters for a bushings upgrade. The engineers there removed the factory rubber pieces that filled in the various linking points in the suspension, and installed Hyper-Flex polyurethane components. For Issue #170, we took the MX-5 back to the track with the upgraded bushings to realize a 1.2-second improvement over factory trim, achieving a best lap time of 2’13.051”. The polyurethane bushings reduced a notable amount of play in the suspension, improving the car’s responsiveness and its ability to rotate on demand. With the bushings in place, the MX-5 then took to a few power upgrades in its first Test and Tune article, found in Issue #170. 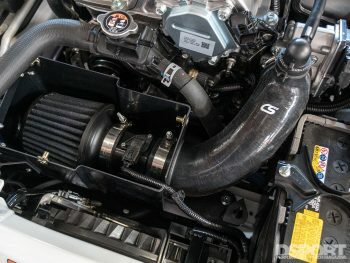 We outfitted the car with a CorkSport Cold Air Intake System, Good-Win Racing RoadsterSport Race Muffler and a custom tune from Delicious Tuning by way of an EcuTek ProECU unit. These upgrades took the car from its factory 135whp and 134 lb-ft torque up to 145whp to 139 lb-ft torque. The new tune also bumped the rev limit from 6,800 RPM to 7,100 RPM with no major dip in power at the top end. This may not sound like a significant leap in power, but remember that these numbers power a 2,300 lbs roadster. The Good-Win Racing RoadsterSport muffler and CorkSport Cold Air Intake System allowed for quick and affordable power gains. 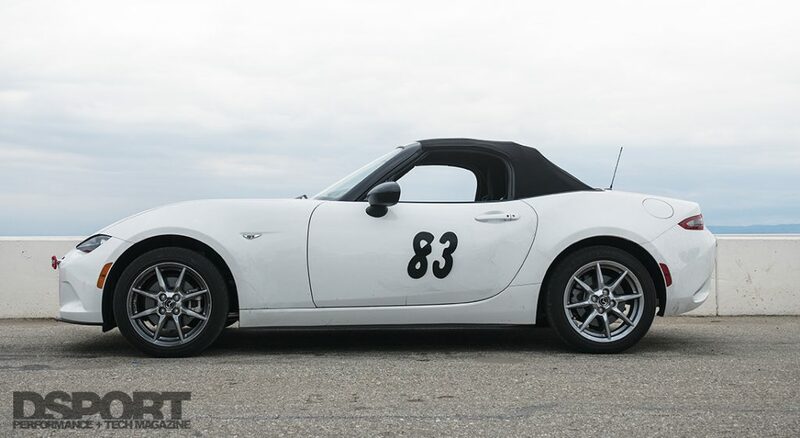 Before making a third trek back to Buttonwillow Raceway, the MX-5 took to a set of CorkSport lowering springs, adjustable sway bars and sway bar end links. 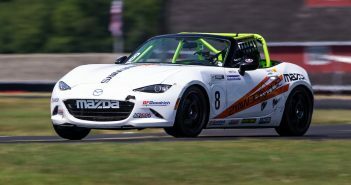 Long Road Racing, builder of the Global MX-5 Cup racecar, provided factory replacement wheels and tires so that we could test the upgrades on a consistent platform. The springs bring the car down much lower than factory equipment, 1.6-inches in the front and 1.1-inches in the rear. The car remained drivable on most well-maintained roads, and never scraped the ground once on the 340-mile trip from the DSPORT office to Buttonwillow Raceway and back. That being said, the underside of the car still got intimate with a few speed bumps. According to CorkSport, the 2.7 Kg/mm front and 1.9 Kg/mm rear springs offer stiffer settings than the factory springs by 13-percent in the front and 58-percent in the rear, aimed to improve the car’s handling on the track with little sacrifice to ride comfort on the street. 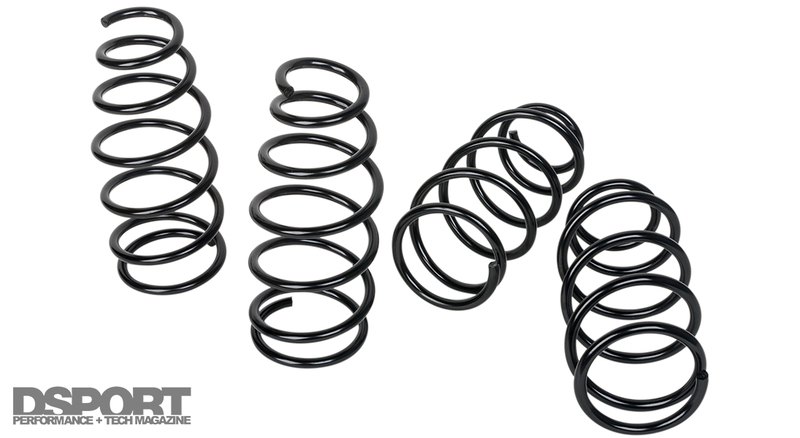 The CorkSport Lowering Spring Set dropped the car approximately 1.6 inches in the front and 1.1 inches in the rear, adding a small amount of rake while maintaining balanced front and rear grip. The adjustable sway bars delivered the greatest difference in the car’s “seat of your pants” feel. 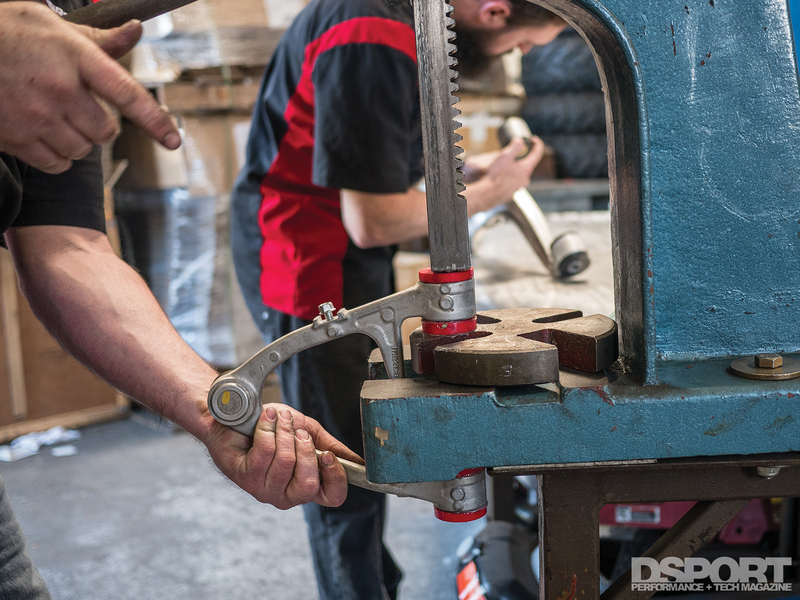 The rear bar replacement can be accomplished in a matter of minutes. The front bar, however, is a different story. You’ll find on Miata forums that the best method to replace the front sway bar is still up for debate. Out of the many methods and ideas that float around to accomplish this, we found that the best way was to go with CorkSport’s official instructions. This involves lowering the front subframe, which turned out much easier than it sounds. Despite the somewhat tedious process of installation, due to the MX-5’s hidden front bar, the effort was more than worth it. The 1.125-inch front bar and 0.625-inch rear bar made for a massively noticeable difference. By CorkSport’s measurements, the available adjustments allow the front bar to increase stiffness from 106-percent to 187-percent over factory equipment, and the rear bar to increase stiffness from 220-percent to a whole 447-percent more than factory. We ran the front bar in the middle setting and the rear bar at full soft, which resulted in a well-balanced platform that stayed flat through hard turns and stuck to the ground far better than before. Like the springs, the benefits of handling improvements far outweighed the slight reduction in daily driving comfort. Since the car would be taking regular trips to the racetrack, we’d need to address the braking system. In order to combat the brake fade that comes with factory fluid and pads, we filled the system with Motul RBF 660 and equipped a set of Porterfield R4-S brake pads. These pads deliver a friction level up to 0.41, enabling a little more stopping power than factory equipment without entering the realm of race-only components that are noisy, dusty and require heat buildup for maximum effectiveness. With all the pieces in place, we realigned the wheels and took the MX-5 back to Buttonwillow Raceway to lay down some laps. 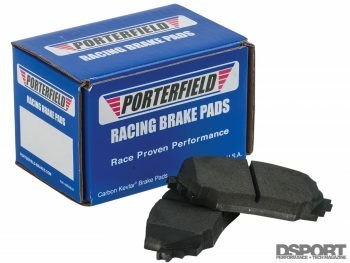 Porterfield R4-S brake pads went into the calipers to handle the stresses and heat of track day driving. A sway bar, or anti-roll bar, reduces body roll by essentially tying both sides of the car together. The ends of the bar attach to a suspension arm or a component that moves with the suspension on each side, while collars typically mount the bar to two points on the frame. As the suspension arms on one side lift and the arms on the other side lower, the sway bar attachment points on the chassis exert opposite forces in response to prevent excessive movement. After pushing the car through the first few corners on track, it already felt like a completely different machine. The crisp, loud tones of the upgraded muffler delivered a great sound in the higher RPM range all the way up to the new 7,100 RPM rev limit. This higher limit proved a great advantage, eliminating the need for gear changes in certain areas. For example, if a third gear corner leads onto a fifth gear straightaway that then approaches a third gear corner, that’s two upshifts and two downshifts required. Depending on RPMs and gear ratios, a higher rev limit could eliminate the need to go into fifth, allowing for more time on the throttle on the straightaway and less complicated downshifting when entering the turn. 300 RPM may not sound like a huge difference, but it was enough to keep the revs in a stronger powerband and reduced the number of gear changes per lap from 16 to 8 (upshifts and downshifts included). The powerband felt more consistent and responsive than before. While this made the throttle pedal feel less forgiving in the middle of the corner, it also provided more control over the car’s weight transfer with the help of throttle. On the straight sections, the MX-5 regularly saw a top speed increase of up to 5 MPH. With the help of the upgraded springs and sway bars, the car flew through corners. The reduction in body roll added a much more connected feel to the car, building driver confidence through the corners. Unlike on factory equipment, the car remained flat through each of the corners and responded quickly to steering and pedal inputs. 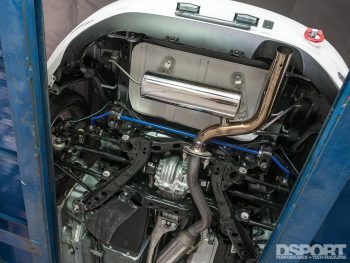 Sections with quick directional changes became much more manageable, as the MX-5 could now change directions almost with little hesitation, no longer having to wait for the body to roll around and the weight to transfer. The factory tires showed signi cant wear after just a day of testing with the new upgrades. We’ll look to performance tires to enhance grip for next time. The new suspension components only mildly stiffened the front end, but massively tightened up the back. This shifted the car’s handling bias from slight understeer to a more balanced front and rear grip, with a small tendency to oversteer. Most racers will prefer this setup as it allows the car to rotate more into and through a corner. But anyone with little driving experience should take caution, as this change makes it much easier to spin out completely. When we last took the car to the track, it proved its excellent stopping ability but only for a few laps at a time. While this came as no surprise as it was on factory equipment, the fluid and pad change allowed for much longer periods of pushing the car to its limits during a session. The factory equipment would only provide two to three laps at most of hard driving, while the Porterfield R4-S pads and Motul RBF 660 fluid carried on for at least double that length before showing signs of degrading performance, which was only minimal. 1) The quick-changing turns of Buttonwillow’s “Cotton Corners” rewards cars that are responsive and can manage weight transfer effectively. The upgraded springs and sway bars quickened the MX-5’s ability to change direction quickly for turns like this, without oversteering too much on entry. 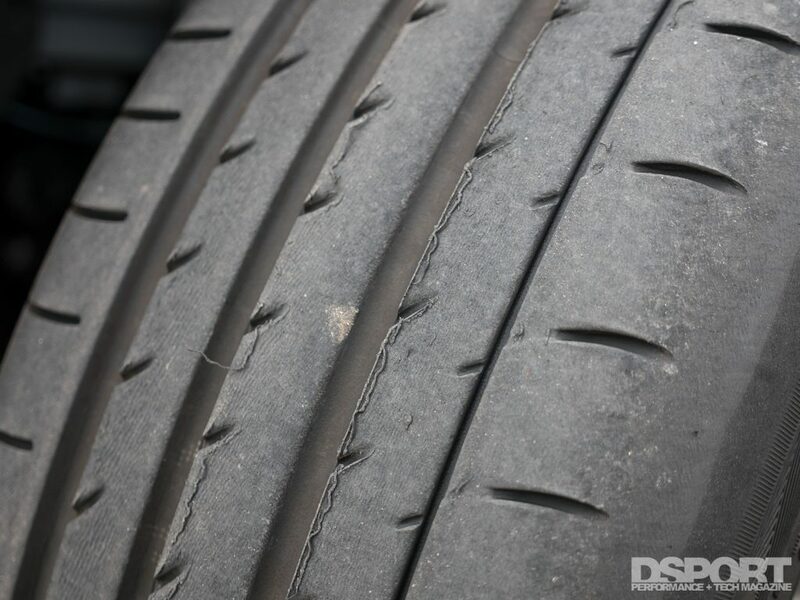 2) The MX-5 saw little improvement on higher-speed bends, as the factory 195/50R16 tires proved to be one of the next major limiting factors to address. 3) Long, medium corners like the “Sweeper” became easier to manage, allowing for throttling on and off to help the car rotate. There’s really no question here, the car drove better and laid down the lap times to prove it. The power upgrades brought the straight-line performance up enough to make a noticeable difference, while the new handling components turned the MX-5 into a cornering monster. However, we’re convinced that there’s still room to make this ND handle even better. Next, we’ll make the switch to coilover suspension and performance tires. We’ll continue the search for additional power as well as the braking components to better slow the car for corners. Sights are set on getting below the 2’10.000” barrier at Buttonwillow Raceway in the next series of upgrades, but trimming three full seconds off of a lap time never comes easy.